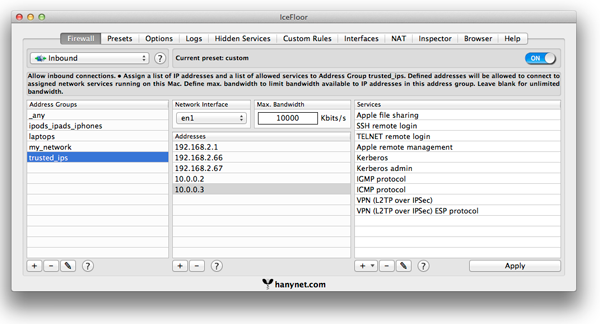 hanynet.com proudly presents the first PF firewall frontend for OS X. IceFloor 2 is group based, like the old ServerAdmin firewall tool. 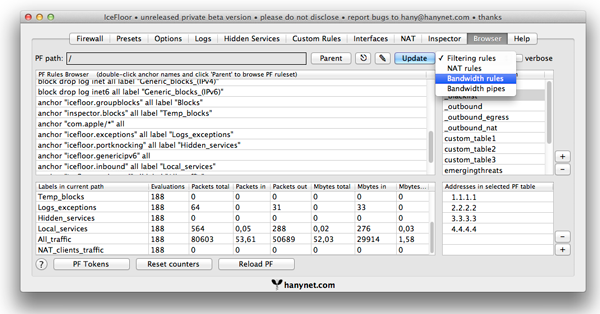 Control filtering, bandwidth, logs, connections and custom PF configurations. 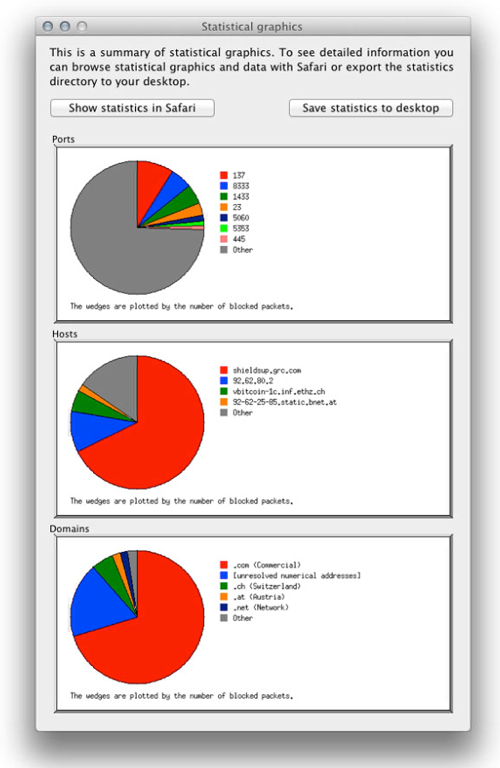 Murus, the new OS X Yosemite PF firewall front end is now available! Murus Lite is the entry level version of Murus, a totally new PF front end for OS X 10.9 and 10.10 Yosemite. It features a great interface and a lot of cool features. Murus Lite is FREE !!! Download Murus Lite here! 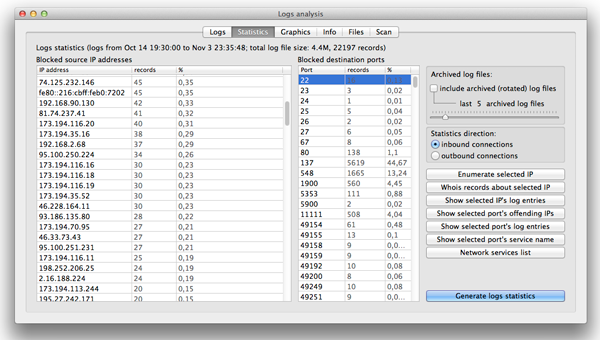 • IceFloor is free and open source. It requires OS X 10.7. Some feature is available only on OS X 10.8 and 10.9. Bandwidth management and other features are not available on OS X 10.10 Yosemite. IceFloor runs on OS X 10.10 Yosemite with limited functionalities. Bandwidth management is not supported. Please do not apply any bandwidth rule on OS X 10.10 Yosemite. You may want to try the free Murus Lite firewall fronted, available at www.murusfirewall.com. Please note that while I am involved in Murus development, Murus and its derivatives are commercial applications, and for this reason they will not be hosted and/or supported by hanynet.com. TO OPEN ICEFLOOR IN OS X 10.8 MOUNTAIN LION AND UP PLEASE RIGHT CLICK ICEFLOOR ICON AND SELECT OPEN, THEN CONFIRM. PLEASE NOTE THAT ICEFLOOR CAN BE USED ONLY BY LOCAL ADMINISTRATOR USERS. Click "Pay Now" to donate using Paypal or credit card. IceFloor 2 is not compatible with older IceFloor versions. Please uninstall IceFloor 1.x before using IceFloor 2. Please read included documentation and contextual helps. • hanynet.com applications are NOT available on the Mac App Store because Apple does not allow AppleScriptStudio applications to be listed on the Mac App Store. AppleScriptStudio is the development technology we used to develop applications since 2005. 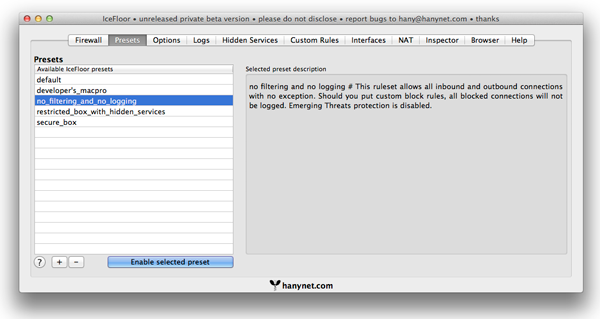 • hanynet.com applications are NOT signed with Apple GateKeeper technology because Hanynet's applications are OPEN SOURCE. 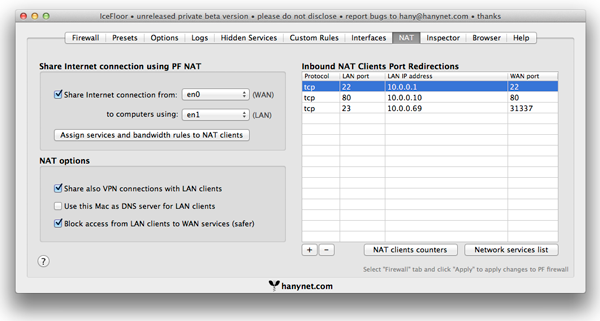 You don't need any sign to trust Hanynet's application because you (and the Mac community) has FREE ACCESS TO ITS SOURCE CODE.